It opened way back in 1949, when a theme park could get away with a few kiddy rides in an open area of park land. Over the years it has grown to be the fifth busiest theme park in the country, with an impressive array of rides that will scare the living daylights out of anyone with a dinkum of sense. Since those with a dinkum of sense tend not to be the types that actually go to your average theme park, this fact is not a barrier to success for Drayton Manor and it currently takes in 1.5 million visitors a year. All we must assume are eager to put them through the stress of riding on Apocalypse, a five-sided drop tower, The Shockwave, Europe's only stand up coaster. Unless they are there to hide from all the excitement and recover their nerve by visiting the zoo area. 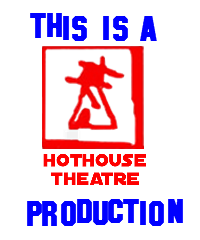 Celebrating 20 years of Hothouse Theatre productions with a spectacular season of shows! ... and pick up some free tickets in the process. Our film crew visited Drayton Manor last summer and came away, more than happy, if a little dizzy and declared it one of the best days out they had had.